Collard greens contain calcium, potassium and vitamins A, C and K. One cup of collards contains more than 20 percent of your recommended daily value of fiber, and 5.7 g of protein. 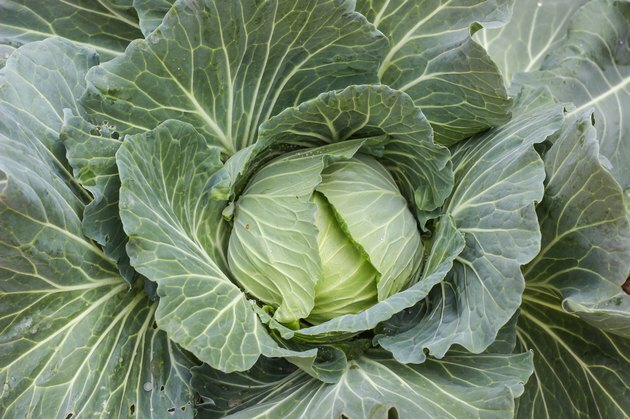 These thick, green leaves are related to cabbage, but unlike cabbage, collard greens grow loose instead of forming heads. A stalk of collards will continuing to produce as you harvest young, tender leaves and boil them as a side dish or add them to soups to create a nutritious broth. Fill the sink with cool to cold water. If putting your hands in cool water bothers you, put on gloves. Set a large bowl aside to hold the wet collards. Separate the collards, which probably came -- or were stored -- bundled together. Spread the collards across the surface of the water. Press down on the large leaves, forcing them into the water. Agitate the collards by either swishing them gently back and forth with your hands or letting them rise up to the surface, then pressing them back down repeatedly. Pull the collards out of the water, place them in the bowl, then drain the water from the sink. You'll see grit and dirt in the bottom of the sink. Rinse this away, then refill the sink and wash the collards again. Do this three or four times, or until you don't see any grit in the water after extracting the collards. If flushing the grit and dirt from the collards down your sink or garbage disposal will cause a plumbing problem, consider washing them in a large bowl or clean pail. Then you can dump the gritty water outside or re-use it for "gray water" purposes, such as watering plants. Once the collards are green, many cooks peel the flesh of the leaf away from either side of the large, woody stem. Discard the stem and cut or tear the rest of the leaf into bite-size pieces before cooking. University of Illinois Extension; Collards; Ron Wolford, et al.